Veteran Egyptian goalkeeper Essam El-Hadary will officially wear the jersey of Wadi Degla when the Egyptian premier league starts this month, according to the player's agent Mohamed Shiha. 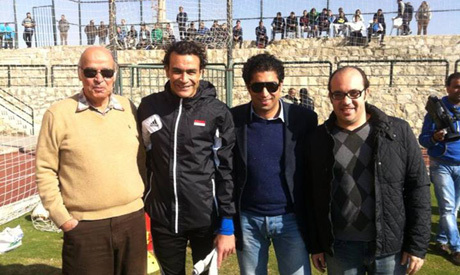 The agent of Essam El-Hadary published a photo of the former Egypt goalkeeper alongside Wadi Degla officials in the club headquarters on his official Facebook page on Monday. El-Hadary's agent didn't reveal the deal's details, writing on his Facebook page only that "El-Hadary has officially joined Wadi Degla." The veteran keeper is free to sign for any club after his contract with Sudanese side El-Merreikh ran out in November. The former Ahly, Zamalek and Ismaily keeper joined El-Merreikh in 2011, winning the Sudanese league in the same year and helping the side clinch two cup titles in 2012 and 2013. The 40-year-old was recently linked with a move to Congolese club TP Mazembe. El-Hadary played a key role in helping Egypt win three consecutive African Cup of Nations titles in 2006, 2008 and 2010, but abruptly fell out of favour after rejecting a bench role during a friendly game against Chile in February. He has not been called up to the national team since then, with the Pharaohs' former coach Bob Bradley relying on Ahly’s Sherif Ekramy in the World Cup qualifying campaign. Wadi Degla joined the Egyptian premier league since the 2010-11 season.